This is the old railway bridge crossing the Ruhr about 300 meters upstream from the Schloßbrücke. I took these photos back in 2004, when there still were overhead wires and the line was still occasionally used for cargo transport, but today it has been abandoned and even some of the rails are gone. 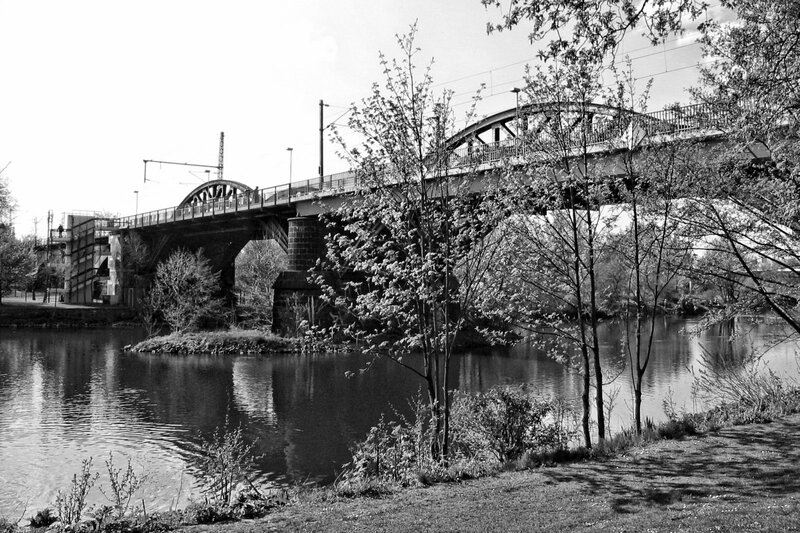 The bridge is still used as a pedestrian crossing and it’s supposed to be a nature bicycle path from Essen in the east to Duisburg in the west, but so far nothing has really happened with it. I actually intend to put everything around the river into a completely seperate series in colour, but I found that the photos of the old railway bridge look great in black and white, so the next few pictures will be a walk over the grand old bridge.